It is never easy to replace a player who can go from one goal line to the other arguably faster than anybody else in the nation. It is also never easy to replace a player who caught 90 passes the year before. In losing Parris Campbell, the Buckeyes will have to replace both. Campbell caught 90 passes for 1,063 yards and tied for the league lead with 12 touchdowns last season. He split time with KJ Hill, who returns, but the Buckeyes will need to replace Campbell’s style of production and playmaking. While Campbell wasn’t used often down the field, he was very busy running crossing routes and handling jet sweeps. He was effective and dynamic and was a constant worry for opposing defensive coordinators. Can Ohio State replace his impact? Perhaps, but likely not with just one player. The H-back was one of Ohio State’s deepest positions last season, so it should still remain well-suited for production this season. KJ Hill returns to do exactly what he has done the last three years. The key is finding somebody to complement him who can do what Parris Campbell did. The first name is Demario McCall, who will be a fourth-year junior in 2019. McCall was able to earn playing time later in the season last year, but should be right in the mix moving forward. McCall brings something to the position that Ohio State hasn’t had since Curtis Samuel, which is an ability to run between the tackles. In fact, depending on what happens at running back behind JK Dobbins, McCall may play as much in the backfield as he does in the slot. There were times last season when the Buckeyes had three H-backs on the field at the same time. That lineup featured Hill and Campbell in the slots and McCall in the backfield. We will likely see that lineup again this season, but with CJ Saunders or Jaelen Gill in the slot in place of Campbell. Saunders is a fifth-year senior who is routinely brought up by receivers coach Brian Hartline. Saunders caught 17 passes in 2017, but that number dropped down to 10 last year. Expect his numbers to go up in 2019. Gill redshirted as a true freshman last season and is physically the most similar to Campbell. He played running back in high school, but also ran plenty of routes out of the slot. The first year of being a college receiver is always difficult, and the second isn’t much easier. Gill did get a couple of games’ under his belt last season, catching one pass, but they will want him being much more involved this season. It could also be possible to see outside receivers like freshman Garrett Wilson or redshirt freshman Kamryn Babb in the slot. They should both be competing at Z with sophomore Chris Olave, but they are both dynamic receivers who could prove to be trouble in the slot. Or maybe even redshirt sophomore Blue Smith. The X position is deep with Austin Mack, Binjimen Victor, and Jaylen Harris. Perhaps Smith could find a role in the slot like Jake Stoneburner did back in 2012. Even though Urban Meyer is retired, you can expect his 2,000-rep club to continue on. As such, KJ Hill won’t need too many reps this spring, but he may get enough to keep him loose and let him learn any new tweaks to the offense. Not having Hill command reps will allow CJ Saunders, Demario McCall, and Jaelen Gill to rotate through more often during scrimmaging. They will each be attempting to show that they can handle as many reps as Brian Hartline will make available. And they are all talented enough to earn those reps and then do something with them. Given his ability to run the ball and sheer playmaking ability, Demario McCall is the best bet to be the 1B to KJ Hill’s 1A. This is provided that he isn’t moved back to running back full time. That ability to play tailback at any time needed, however, will allow the Buckeyes to play more H-backs than they did a season ago. In terms of how often each player is lining up in the slot, it would not be a surprise to things split pretty evenly between McCall, Saunders, and Gill. KJ Hill is likely too good to make this a four-person rotation, but there could be a three-person rotation behind him. Managing this position will be interesting to watch. The Buckeyes have basically just alternated two groups of starting wide receivers for years now. There was a first batch — say Campbell, Mack, and Terry McLaurin, then the second batch — Hill, Victor, and Johnnie Dixon. 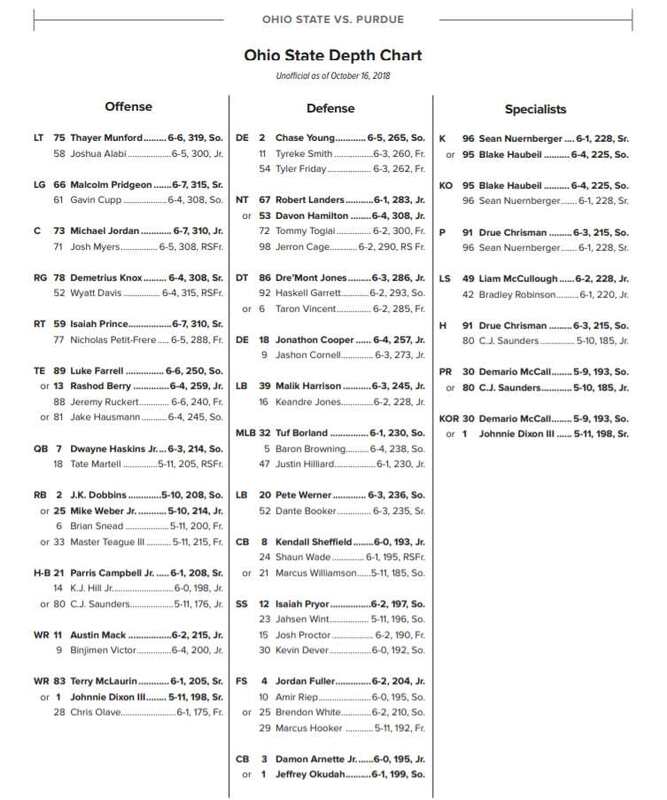 Looking at the roster, however, the Buckeyes finally appear to be three-deep at each of the three receiver positions, so we may be looking at a change in how these rotations are handled. 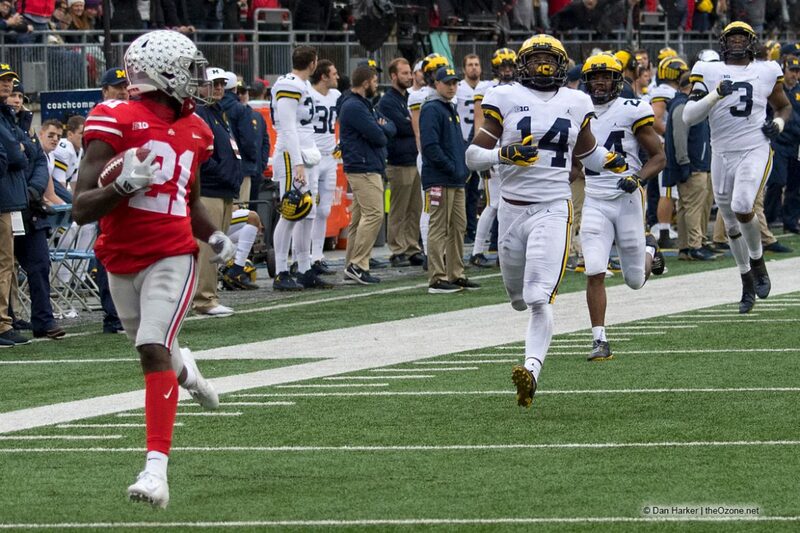 I’m just hoping fields can get these guys the ball close to what haskins could and Barrett couldn’t. If true.. Olave, Hill, and dmac should have a solid season. I’m really interested to see if garret Wilson gets some meaningful targets and during garbage time. I think Jaelen Gill is going to bring back memories of Ted Ginn, Jr. He will be that dynamic. He will return a punt and/or a kickoff for a TD this season. Where he lines up on the field will be will be a day time decision (I could not help that) but he will be dynamic. Saunders might be a Hartline clone. So many options – the trick is keeping everybody happy – they did a great job of that last year as DH was not hesitant to spread the ball around. This will be the first FULL year since Urban Meyer first showed up at Ohio State with his new coaching staff where I feel very comfortable with the education and the production AND the depth at the wideout positions. KJ and DMac are my first choices for H-Back, but, Jaelen Gill is a whole lot faster than I’m hearing from some folks. If he gets completely up to speed on the position requirements, he’s going to be a terror for opponents to try to contend with. He has the agility of Johnny Dixon with good wheels with the plant and go acceleration of Curtis Samuel. Don’t be surprised to see a freshman TE also lined up in the H position at times. We are loaded. Fields and Day are going to have a…. well, you know. McCall is probably the only one as he seems to be the best burner out of all of them. Thanks for the Picture with 3 MI chasing w/o hope. Given how many years it took to replace Michael Jenkins they might not. But I agree w/Kurt that McCall is the best candidate to based on speed and what he does with the ball in his hands. What is wrong with Gills speed? Nothing at all, Hank. But we know what Demario can do with the ball after he’s got it. Speed alone doesn’t make a kid a threat. Remember the kid from Texas a few years ago everyone was fawning over before he’d taken a snap and then did only ‘okay’ for four years? Gill might indeed be better than McCall, but I’d have to see it to believe it. McCall’s had flashes since his true freshman year.